Before reading on about treating your dandruff at home, make sure you actually have dandruff. Chances are a good amount of the people visiting this page will actually have dry scalp, which differs from dandruff in symptoms and treatment. If you know you have dandruff, than read on. 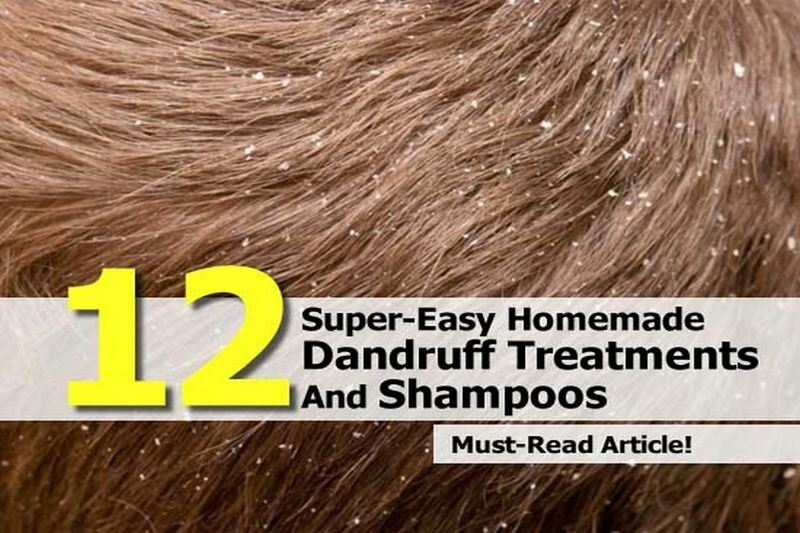 Below are 12 homemade dandruff treatments to help you kick the crusties. Put simply, dandruff is the result of skins cells maturing and dying too fast, building up, and causing irritation. Vinegar will get rid of the unwanted skin that would flake off into dandruff, and it won’t clog up your pores or cause more. An overgrowth of fungus can also cause dandruff, and vinegar acts like a fungicide. Using it is straightforward, simple, and is probably easier on your hair than some shampoos out there. Mix together the warm water and vinegar in a cup. The total amount may be varied to be more or less depending on how much hair you have. Pour the mixture over your hair, scrub it around gently for several minutes, and then rinse it thoroughly with water (only water!) Wait about 8-12 hours before taking a normal shower. Repeat once every week or two weeks, depending on how often you feel you need it. Baking soda is just an all-around useful thing to have in the house. It plays a large part in a lot of natural home remedies, and for good reason-it usually works! It helps to remove dandruff for a number of reasons. First, it mildly exfoliates, which gets rid of the excess dead skin. It’s also kills off acts as a fungicide, and a common fungus that occurs on everyone’s scalp can cause dandruff if it becomes overly abundant. In addition, its tiny particles can be useful in actually removing those loose flakes stuck in your hair- instead of just breaking the pieces of skin up into smaller pieces. Mix one tablespoon of baking soda to every one cup of warm water. If you’re using an old (clean) shampoo or soap bottle, shake up the mixture and apply generously. Otherwise, stir it before you use it. Do this in place of shampoo, daily if possible. Your hair may feel quite dry in the beginning, but its natural oils will restore themselves soon, and they will be much more balanced than when using some commercial shampoo. If you feel you absolutely must use shampoo (and really try the baking soda alone first if you can) you can add a teaspoon of baking to a handful of shampoo and use that instead. The rosemary oil is optional, but some people find rosemary helps dandruff and think it has a pleasant scent. Fenugreek is a plant that is used commonly as a spice, particularly in Indian cuisine; however it serves medicinal purposes as well. Fenugreek seeds have a composition that is rich in protein and amino acids, encouraging healthy hair/hair growth and warding off those wicked flakes in the process. A little bonus-its high concentration of lecithin (a natural emollient) can help make hair stronger overall, and many people find that it leaves their hair silky smooth and soft. Soak the seeds in 1-2 cups of water overnight. The next morning, grind them into a fine paste and apply to your scalp. Leave it applied for 30-45 minutes, then wash with mild shampoo or water. Neem leaves (also an Indian herb) make a great all-natural home remedy for your dandruff. Their properties not only relieve itching, they act as an antifungal as well, inhibiting the over-growth of dandruff causing fungus. Be aware that some people find its smell to be overwhelming. Add two handfuls of neem leaves to 4 or 5 cups of hot water. Let it stand overnight. The next morning strain the liquid and use it to rinse your hair. You can also try making a paste out of leaves, applying it to your scalp, and letting it sit for about an hour before washing it off with water. Listerine was actually created in 1879 by a doctor in Missouri and used as a powerful surgical antiseptic for dentists. When the good doctor sold it to a pharmaceutical company, it uses broadened and it became the first over-the-counter mouth wash ever sold in the United States. In the 1930’s and ‘40s, one its original purposes was also to fight dandruff. It may seem random, but consider that Listerine fights fungus, and one of the most common cause of dandruff is an overabundance of…you guessed it, fungus. Mix 2 parts water with 1 part Listerine. After you shampoo, spray or pour the solution onto your scalp, massage in well, and let sit for 30 minutes before rinsing with water. It’s not known exactly why, but there have been links between dandruff and exposure to sunlight. There have been many cases in which the severity of dandruff lessened when the afflicted person spent more time in the sun. It’s possible that instead of dry weather in the winter causing dandruff, it’s really the lack of sunlight. Maybe the light helps dry up some of the excess oil, or maybe getting a little time outside in the sun makes for a happier healthier human overall. Whatever the exact reason is, it’s something to try, and it’s probably one of the most straightforward homemade dandruff treatments you can try. Spend at least 10-15 minutes out in the sunlight every day that you can. Make sure to limit your time though – too much sun and its UV rays can be harmful to your skin, hair, and health. Aspirin can help with more than just headaches – it’s also one of the easiest homemade dandruff treatments. Pure Aspirin uses a large percentage of Salicylic Acid, which is an active ingredient in many commercial anti-dandruff shampoos. Salicylic Acid has fungicidal and anti-microbial properties to fight the extra flakes caused by fungus, while the Aspirin helps with the inflamed skin that often goes hand-in-hand with severe cases of dandruff. Crush up the Aspirin until it becomes a fine powder. Add it to your regular shampoo before use, making sure to leave it in your hair for about 2 minutes before rinsing completely. You knew it would be on here, somewhere. Eating healthy helps every aspect of your well-being. These days we’re learning more and more that diet is truly vital to our health, so it comes as no surprise that it would have some impact on skin conditions, including dandruff. Of course, food that is extremely fatty and/or unhealthy should be avoided – but that’s common knowledge whether you follow it or not. What you may not know it what to eat to help your scalp and why, so check out the list below of some foods you should aim to eat that may help you get rid of those pesky flakes-and keep them from coming back. Veggies: Green leafy vegetables in particular impact how our skin behaves. It encourages healthy hair, skin, and nail growth, so shoot for stuff like broccoli, kale, and lettuce (NOT iceberg) to add to your diet. Fish Oils: Fish oil can make a difference in the overall make-up of your skin. Taking fish oil supplements will not cure your dandruff, but it can help lessen its severity and/or prevent it. Lean Proteins: To minimize dandruff, try eating more lean proteins. They help to build hair and skin and keep it coming in healthy. Aim for fish and non-meat proteins, such as eggs, nuts, and beans. Lemons have a tough reputation, but they might be able to shake it – if they help you shake the flakes first. The acidity in pure freshly squeezed lemon juice contains acids that can help break down the fungus that is often the cause of dandruff outbreaks. It’s also free from harsh chemicals and other unnatural ingredients that often do more harm than good to our hair and scalp – plus it leaves you smelling clean and fresh. So remember, the next time life gives you dandruff, give it lemons. Massage 2 tablespoons of lemon juice into your scalp and let it sit for a minute. Mix 1 teaspoon of lemon juice into 1 cup of water and rinse your hair with it. Repeat daily until no longer needed. While excess oil can be a root cause of dandruff, some oils can still be helpful in keeping it under control. Tea tree oil has been used medicinally for centuries. Aboriginals in Australia would pick the leaves of the tea tree plant and break them (much like we do with aloe) before using them as a topical treatment for burns, cuts, bites, and so on. The oil extracted from those leaves have fungicidal properties and it is overall soothing to the skin-especially when it is sore or itchy. Be aware that tea tree oil, while safe for topical use, should NOT be ingested under ANY circumstance. Pour 1 tablespoon of tea tree oil into 1 cup of warm water in a squirt bottle. Shake well. After shampooing, spray the mixture all over your scalp, massage, and let it sit for a couple of minutes. Pat the excess moisture out, but don’t wash it out. Aloe Vera gel is synonymous with “ahhhhh…relief” in many people’s minds. While it may be used more commonly to help minor burns, it can also help give you relief from dandruff. It works because its constituents inhibit the process of skin cell proliferation. In other words, the stuff that makes it up slows down how fast your cells grow, and since dandruff often is caused by cells growing and dying too rapidly, the aloe can help restore them to normalcy. Apply Aloe Vera gel to the scalp 15 minutes prior to washing your hair. After 15 minutes, shampoo and wash it as normal. Salt is something most of us have lying around, something we use every day. But did you know that it can also help get rid of dandruff? It’s slightly abrasive crystals will work as a natural exfoliator, getting off the extra oil and dead skin flakes. It is effective because it clears a path, if you will, for the shampoo which can sink in and work to its fullest potential. While rubbing salt on your scalp may not sound like spa treatment, it can actually feel quite pleasant, especially if your skin is itchy. -3 tablespoons of salt (Epsom salt works well if you happen to have it, but regular table salt is fine too. Gently massage 3 tablespoons of salt into your dry or slightly dampened scalp for 2-3 minutes. Shampoo immediately afterwards. You can also watch this Video HERE to learn about other homemade dandruff treatments. If you’re not sure how you feel about washing your hair with some of the natural stuff used to treat dandruff, here are some tips that can still help you get rid of it at home. You find that one shampoo…that one anti-dandruff shampoo that finally works. Deep down, you know it’s the shampoo for you. Then, without any warning, it just…quits on you. The dandruff starts coming back, and it’s time to realize that you have to move on if you want to shake the flake. This isn’t uncommon-people often build up a tolerance to a shampoo and its active ingredient. If yours stops working abruptly this may be the case, so switch as soon as you can. To keep this from happening, you can switch up what you’re using every month or so. Find 3 different kinds of anti-dandruff shampoo, each with a different formulation, and rotate them to prevent them from becoming ineffective. Obey The Law Of L.R.R. That direction is there for a reason though – it allows the shampoo to work at its best and really do what it is supposed to do. Next time you’re in the shower, do an initial lathering before rinsing it off to get rid of most of the flakes and oil buildup. To really fight the dandruff, lather a second time and let it sit for 5 minutes. Then the shampoo can penetrate the skin cells fully and really go to work. Many people are of the belief that dandruff is caused by dry skin, and try to make up for this by shampooing less so as to not strip the skin of its natural oils. They may also use special shampoo for dandruff when they really have dry scalp, which will just dry it out even more. One of the biggest causes of dandruff is oily skin – that is why the skin flakes are often greasy, not dry. The best way to combat this is to shampoo more rather than less. Since that dandruff is a build-up or excess of rapidly maturing skin cells, scrubbing with shampoo can help get the itchy layer off naturally. It can also help ward off overgrowth of the Malassezia fungus. Dandruff can seem like an unconquerable enemy, but there are a number of effective ways to manage it and lessen its severity – and not all of them have to involve harsh chemicals or an expensive trip to the dermatologist. The next time you get down about shaking the flake remember that some of the most effective homemade dandruff treatments could be right in front of you, maybe even as close as the salt shaker on your dining room table.